She did wake up and her furtive looks have these guys putting on a show right now. Women, huh. Good shot though. Same game different species for sure. Have a great day Alix. I love these! We have some on our lake. They are so cute and make the mallards look huge! Hi Laura, the hoodies are fun to watch for sure and in comparison to the mallards they are indeed tiny. It is always fun to see a variety of ducks on a lake and notice just how different in size they can be. I agree mike. I just looked outside the window and there are a lot of mergansers paddling around and diving on the lake right now. I am envious. I have to drive a bit to get to see that. Enjoy the view. Thanks Marsha, hope your day is going well. She’s gorgeous, as are the males – love that crazy yellow eye! The yellow eyes on the males and the wonderful hairdo of the females make them the perfect match. Great photo! Her hairdo is superb! I just saw a male and a female this morning, in a pond in False Creek. 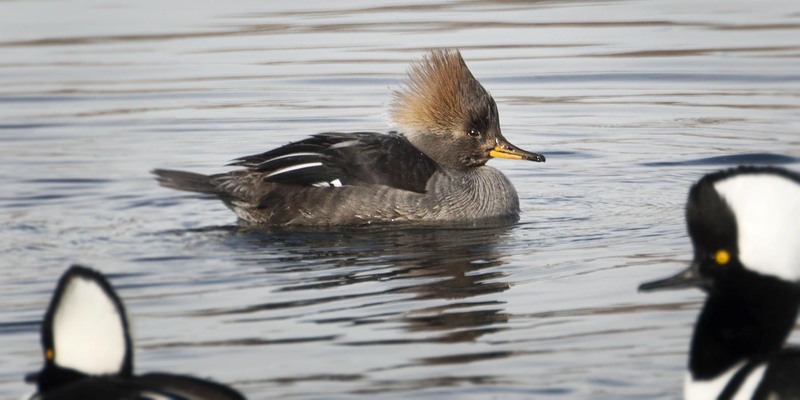 My first time seeing Hooded Mergansers “in real life”. They were quite busy cleaning themselves. The weather was lovely, but the weather report called for rain, so I did not bring a camera. Glad you took a nice picture. Well, I hope the weather clears up and you get your opportunities for some photos. Hoodies are really fun to watch and early mating season is always fun with their displays and games. She even seems to smile. (Amazing as well, what we humans are able to interpret). Hi Suzan, it is fun to watch these guys and to see the ducks interact with each other and to be able to get a photo is all the more fun. She does have that I wonder if they notice me look and really a cute smile as you notice. Hope your day is going well. Thanks, got an interesting conversation elsewhere 😉 – hope your day is fine too. I’m sure she’s very aware of your looks – and of the guys around. All part of the game. Yes life is indeed a game or a drama being presented on a stage it seems. I have a coot photo where they might not be smiling they are certainly expressing some thoughts that are fun to observe. Maybe I will post it soon. Oh, yes, please. When you have time. I know I’m being unfair to the coots. Love these guys! I see them around my lakes here in Seattle! HI thanks for the feedback. The hoodies are sure fun to observe. DO they stay put on the lakes all summer or are they seasonal in the Pacific Northwest as they are here? Hi, thanks for you insight. The next time I am up your way I will give Lake Washington a look and see what I can find. Have a great day. Thanks Miriam, hope you doing well and having a wonderful weekend. I’ve always been lead to believe that was call playing hard to get.